"This is a fast, easy way to make creamed soups. You can also use most any frozen vegetable. Cream of broccoli is also delicious." 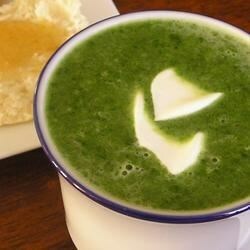 In a medium saucepan, combine water, bouillon, and spinach. Bring to a boil, and cook until spinach is tender. Melt butter in a large saucepan over medium heat. Stir in flour, and cook for 2 minutes. Gradually whisk in milk. Season with minced onion, salt, and pepper. Cook, stirring constantly, until thickened. Stir in spinach mixture.